I’ve had the intention to start a weekly Red Line BRT construction thread. Since construction is starting to happen closer to my neck of the woods, I should be able to get some photos pretty easily. If you have photos of construction elsewhere along the BRT line, please let me know in the comments, or e-mail them to me at kevin dot kastner at gmail dot com. 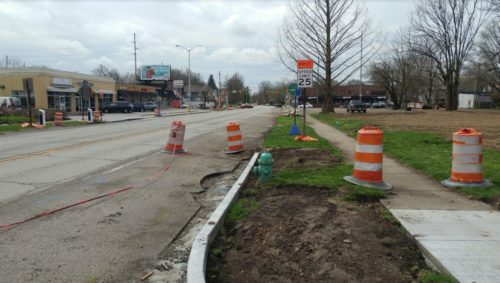 Here’s 50th and College,, which has a new curb bump-out on the north side of the intersection, as well as new ADA ramps for the sidewalks. Pedestrians will be encouraged to cross College at 49th Street (see map below), so there is no ramp for east-west crossing. 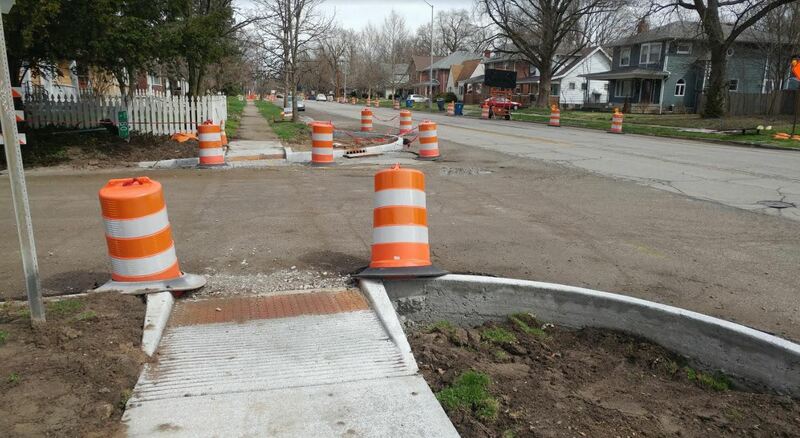 INDIANAPOLIS (April 2, 2019) – Indy’s first rapid transit line is in the home stretch of construction. Opening the Red Line will accompany a major wave of improvements to IndyGo service including every route running every day, improved frequencies, and easier transfers. I was excited and planned on riding the Red Line everyday to my office downtown. I live a short distance away from the line and there aren’t any sidewalks or paths from 86th to 66th. I reached out to Indygo to get information on where I could park my car. Unfortunately no park and ride options are available. This is a huge disappointment. You’re basically right about the sidewalks, although they are on one side of College Avenue up to the Blind School. Park and Ride is probably possible without an official program. The BR Garage should have plenty of spaces, but of course, it’s not free. There are other parking spots throughout Broad Ripple. I’d encourage you to at least try it, before ruling it out. Doubtless there will be a connector route from Glendale (currently the 17 route) to BR Ave. & College. The east lot at Glendale is a stop on that route and has served as Park & Ride before. I’ve followed the project, but this is the very first mention I can recall about the protected bike lane(s) on Illinois. Looking at the plans, this is awesome – a protected lane from downtown at Washington of the road all the way to 18th Street. Even better, this protected lane is on the LEFT side of the road, which is really important to avoid “right-hook” accidents with cyclists in traditional right side bike lanes. As someone who rides on the current Illinois Street bike lanes, they are terrible and can be terrifying. This should be a tremendous help in getting out of the congested downtown traffic, which clears significantly after 16th street. Slightly related to Mike’s comment, I’m wondering if some sort of suburban commuter lines will come back. Back when gas was over $4/gal, there were commuter buses that came from (I think) Meijer in both Greenwood and Carmel. It was something like $10 to ride. It would be cool if a private company could show the demand from, say, Carmel to Broad Ripple or Greenwood to UIndy and make the case that the Red Line should be extended. For what it’s worth, long term Red Line plans include extensions to Greenwood and I think all the way up to Westfield. Pretty anti-pedestrian to tell people it’s illegal to cross the street at an intersection, and tell them to walk an entire block out of their way just to cross the street. Do you know why the 52nd Street and 54th Street stations are being located a half-block south of 52nd and a half-block north of 54th Street, instead of at the intersection like almost all the other stations? 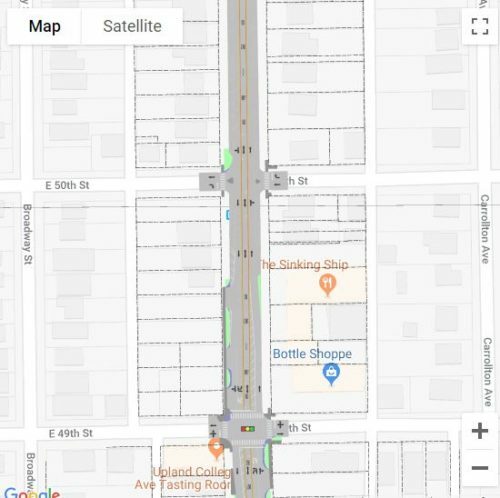 I’m wondering how much the additional stop lights at those stations (shown on IndyGo’s plan view: https://www.indygored.com/project-overview/ ), which i presume will be activated every time a pedestrian wants to cross to/from the station, will cause unnecessary traffic backups on College Avenue. Just not sure what the benefit is when the pedestrians could’ve used the existing crosswalks & signals at the intersections, presuming the signals actually work, which seems to typically be about a 50/50 chance throughout Indy, and considering that most riders are probably going to want to walk back to those intersections anyway. I understand. I do wish they could have found a way to put at least one crosswalk at every intersection. They really don’t want people to cross College without some sort of light. For what it’s worth, they originally were going to have a 4 block section without a crosswalk, and there was a community push back (Ok, so I mentioned it to them in a public comment) to include a crosswalk with yellow flashing lights in the middle of that section. > Do you know why the 52nd Street and 54th Street stations are being located a half-block south of 52nd and a half-block north of 54th Street, instead of at the intersection like almost all the other stations? The priority was to protect vehicle LOS by adding separate turn lane at these intersections.